University of Wyoming researchers have long been at the forefront in documenting the special properties of spider silk, and in searching for ways to produce the strong substance for beneficial human uses from medical sutures to body armor. Now, UW researchers have played a major role in advancing spider silk research to an even higher level. Working with colleagues at the University of Notre Dame and Zhejiang University in China, UW researchers have genetically engineered silkworms to spin silk containing spider silk proteins. Those fibers are stronger than fibers normally spun by silkworms and almost as tough as spider silk. The development opens the door to what could be the most efficient and economically feasible way of producing spider-silk-like fibers for human uses, says Don Jarvis, the UW molecular biology professor who led the project. "These results demonstrate that silkworms can be engineered to manufacture composite silk fibers containing stably integrated spider silk protein sequences, which significantly improve the overall mechanical properties of the parental silkworm silk fibers," Jarvis says. "Silk fiber holds great potential as biomaterials for wound dressings, artificial ligaments, tendons, tissue scaffolds, microcapsules and other applications, and this takes us closer to reaching that potential." The team's research was publicized in the Jan. 3 edition of the Proceedings of the National Academy of Sciences, one of the world's top scientific journals. The successful genetic engineering of silkworms has attracted worldwide media attention, and Jarvis has spent much of this week responding to questions from reporters around the globe. Under the leadership of former UW molecular biology Professor Randy Lewis, UW researchers identified the genetic sequences that allow spiders to spin their especially strong and elastic webs. Because territorialism and cannibalism among spiders precludes spider farming as a viable means of manufacturing spider silk, researchers then genetically engineered other organisms -- ranging from bacteria to goats -- to produce those proteins. But spinning those proteins into useful fibers has proven expensive and slow. Genetically engineering silkworms -- which for centuries have been used to produce silk for textiles and some other uses -- eliminates the need for those costly spinning technologies. Jarvis, who has been at UW since 1997, has spent most of his career studying insect biology and genetics in regard to disease-related matters. But discussions with Lewis and a colleague at Notre Dame led to a three-way collaboration designed to create genetically transformed silkworms capable of producing silk containing spider silk proteins. After two unsuccessful attempts to secure research funding, Jarvis wrote a successful grant request to the National Institutes of Health in 2007. The result was the successful three-year project reported in the Proceedings of the National Academy of Sciences. "It was a hard project, risky, but in the end we had a little bit of luck and got exactly the results we wanted," Jarvis says. UW researchers under Jarvis developed the genetic sequences to alter the silkworms, which were housed at the Notre Dame laboratory. 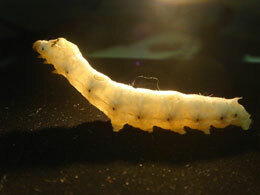 The UW researchers then did a good share of the testing of the modified silkworm fibers. Previous attempts by other researchers to incorporate spider silk proteins into fibers spun by silkworms resulted in relatively low yields and didn't adequately combine the spider silk proteins with the silkworm fibers. That wasn't the case with the UW-led study. Jarvis says the composite fibers, with 2 to 5 percent of spider silk proteins woven in, were up to four times stronger than regular silkworm fibers and almost as strong as spider silk. The next step for researchers, he says, is to engineer silkworms to spin silk that contains only spider silk proteins. "We simply proved that spider silk proteins could be assimilated into the silkworm fibers," he says. "But it's clear that the silkworm is a uniquely qualified platform for this particular biotechnological application." 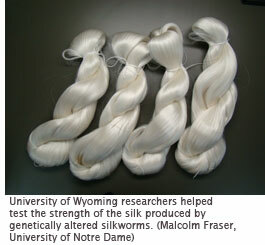 The University of Wyoming holds many patents covering spider silk and transgenic insect technology. UW has granted at least two licenses to the patented and patent-pending technology for the commercial development of these revolutionary technologies, according to Davona Douglass, director of the university's Research Products Center.